People desirous of bringing home a hamster and those who already have hamsters as pets might be aware that these rodents prefer munching on fruits’ and vegetables’ slices. At the same time, enthusiasts of hamsters should also be in the know that apart from a few varieties, most of the veggies and fruits can be included in the rodent’s diet. This generalization could exhort admirers of hamsters to ask a very simple and practical question which is, should hamsters eat strawberries? 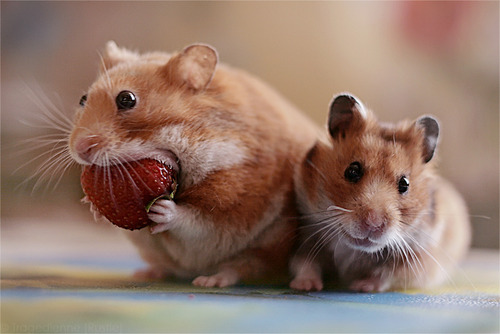 For a start, it can be stated confidently that strawberries are extremely healthy for hamsters and hence thoroughly safe for them to consume from the perspective of their well-being. Till date, there is no documentary or circumstantial evidence to prove that strawberries are harmful for hamsters with regards to their health. However, when you offer strawberries to your pet hamster for the first time, make sure you’ve washed them properly in clean and running water. Never feed your pet an entire strawberry or place the same in front of her. 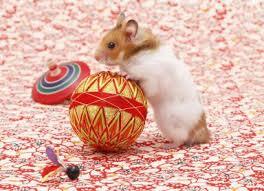 Even if your hamster takes a liking for the fruit, attempting to feed a whole berry at one go might spell trouble. There’s every possibility of her having an attack of diarrhoea or vomiting if she has ingested an abnormally large quantity of the fruit in comparison to her size. Take a single berry, slice it up, and offer a single slice in the beginning. You can groom the pet hamster in a manner that the cute rodent eats out of your hand. In that way, you’ll be able to monitor the exact amount or quantity of a particular fruit or vegetable that is going into her mouth. Do not feed the hamster strawberry slices more than 2-3 times in a week. 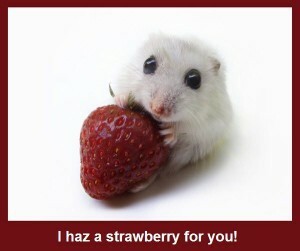 Does Hamsters eat strawberries and are they beneficial? Strawberries are very wholesome fruits and their consumption can be nutritionally beneficial. Strawberries abound in vitamin C, vitamin B6 Choline, calcium, phosphorus, magnesium, and potassium that are good for your hamster’s well-being. Antioxidants in strawberries help drive out toxic wastes from the body and prevents excessive fluid build-up. Vitamin C boosts up the immune system empowering the white blood cells to ward off attacks from harmful bacteria and viruses. Furthermore, antioxidants present in strawberries prevent numerous eye disorders like macular degeneration, astigmatism, and cataract. Strawberries are also rich in several other minerals and elements that can keep your hamster healthy all through her life. For instance, calcium will keep her bones strong and stout while potassium can promote flushing out of toxins and excess fluids. There are specific minerals that’ll provide the hamster with sufficient energy to keep her active as well as boost up brain and heart functioning. Any Side Effects Associated with the Consumption of Strawberries? Recent studies and research on the cultivation of strawberries strongly indicate that latest pickings of these berries are laced with a high level of pesticides. The high content of residual insecticides can prove fatal for your pet. Never buy packed strawberries from departmental stores rather buy them straight from open-air farmers’ market. In conclusion it can be expressed that strawberries are safe and healthy for your pet hamster as long as you feed the berries in very minuscule amounts. Also cleansing the fruit completely before slicing, washes away any residual pesticide rendering it thoroughly safe to consume.